See WCCC Statement of International Solidarity here. TORONTO – On Thursday September 28th, the Women’s Coordinating Committee for a Free Wallmapu (WCCC) rallied along with supporters in solidarity with Mapuche Political Prisoners on a 114 Day hunger strike in front of the Toronto Chilean Consulate, calling for a Day of International Solidarity in support of the Mapuche. 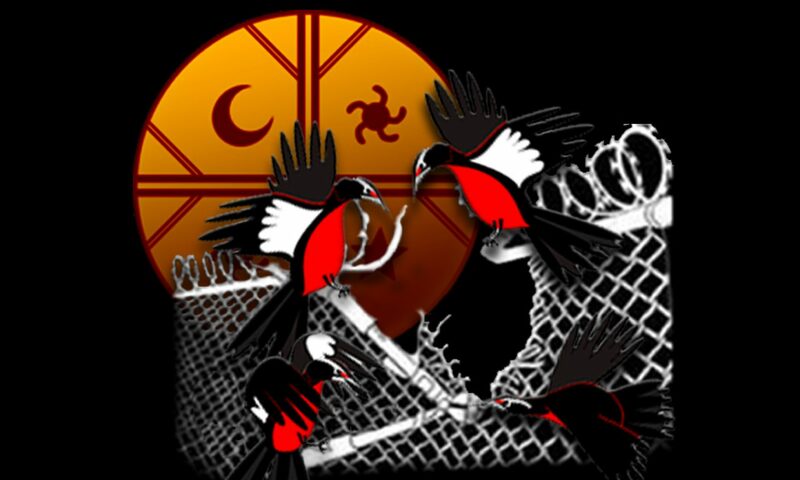 Despite the short notice for the urgent call to action, more than 40 organizations throughout the world joined this call to solidarity, demanding that the Chilean state and its government in turn adhere to the demands made by the Mapuche Political Prisoners. These include a variety of organizations across Europe, as well as local anti-colonial groups and indigenous collectives across Turtle Island, most notably our sisters and brothers of the Mi’kmaq Warrior Society and Ground Zero INAC Toronto – Vigil for Indigenous Youth Suicides. The boisterous protest interrupted rush hour in the busy downtown intersection, denouncing the colonial genocidal policies of the Chilean government against the Mapuche nation that could be heard all the way up to the 18th floor, where the Consulate office is located. Guest speakers at the rally included Ana Iraultza, of Barcelona, Catalunya, and Sue Goldstein of Actions4Palestine, who manifested their solidarity to the Mapuche hunger strikers and the Mapuche Nation, connecting the anti-colonial, anti-fascist, and anti-imperialist struggles taking place throughout the world. Ana Iraultza stated the current repression of the Spanish State against the people of Catalunya in their struggle for independence, where a dozen organizers were recently arrested in connection to their organizing in the independence referendum, which took place earlier this month. At the same time, she reiterated the necessity to support peoples in struggle throughout the world, specifically mentioning the Mapuche Nation that is currently suffering brutal repression on behalf of Chilean authorities. Sue Golstein of Actions4Palestine also reiterated this solidarity with peoples devastated by imperial colonialism, comparing the current situation of the Mapuche to that of the people of Palestine. In reading the poem “A Moment of Silence,” by the Chicano poet, Emmanuel Ortiz, the Actions4Palestine representative remembered those that have fallen in anti-imperialist struggles, many times forgotten in history, while giving her solidarity to the Mapuche hunger strikers and the Mapuche cause. Throughout the heartfelt speaches, more than 200 pamphlets were handed out to inform passers-by of the situation of our Peñi [brothers]. WCCC would like to thank all those present at the rally giving their solidarity to our people, to our wonderful speakers and the dozens of organizations (full list to follow) that support the International Day of Solidarity with our Mapuche Political Prisoners on hunger strike. Bachelet, you will see, Wallmapu will be Free! Free Our Mapuche Political Prisoners on Hunger Strike! Free ALL our Mapuche Political Prisoners throughout the territory! * Toronto is the shared traditional territory between the Huron-Wendat, Mississaugas of the New Credit, Haudenosaunee nations. ** Calgary is the shared traditional territory between the Blackfoot, Siksika, the Piikuni, the Kainai, the Tsuut’ina and the Stoney Nakoda nations.